July 16, 2018 (The Radiance Foundation) – What is it about truth that sends people scrambling to their "safe" (dishonest) spaces? Online, in schools, in entertainment, in news media, there is such a visceral aversion to the truth. Even among fellow Christians, who claim that the truth sets us free, the resistance to inarguable facts is often met with misapplied defenses of grace and non-judgement. One of my latest memes, to focus on #WorldPopulationDay, set off a firestorm among those who think that invoking history to illuminate its repeated present is "offensive", "disgusting", and "hurtful". This just in! While writing this article, we were censored by Deities of Diversity. 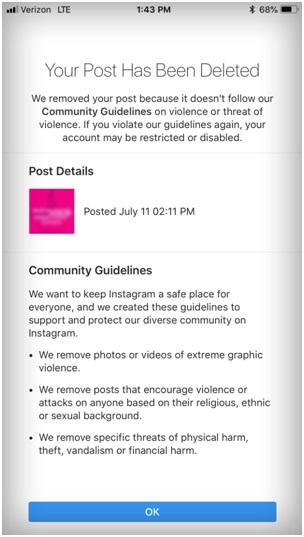 Apparently, Instagram deleted our post, threatening to restrict or disable our account if we violate their guidelines again. But...we didn't violate any guidelines. The explanation they included in the warning were about threatening violence. Of course the meme wasn't threatening violence – it denounced racial violence, no matter the era. But Titans of Tolerance have no interest in the truth. They can delete our posts, and even our account, but they can't delete the truth. And of course, there was no due process, no appeal process, no one to reach to correct this injustice. There was no option other than to click OK and the purge was complete. #Liberalism. 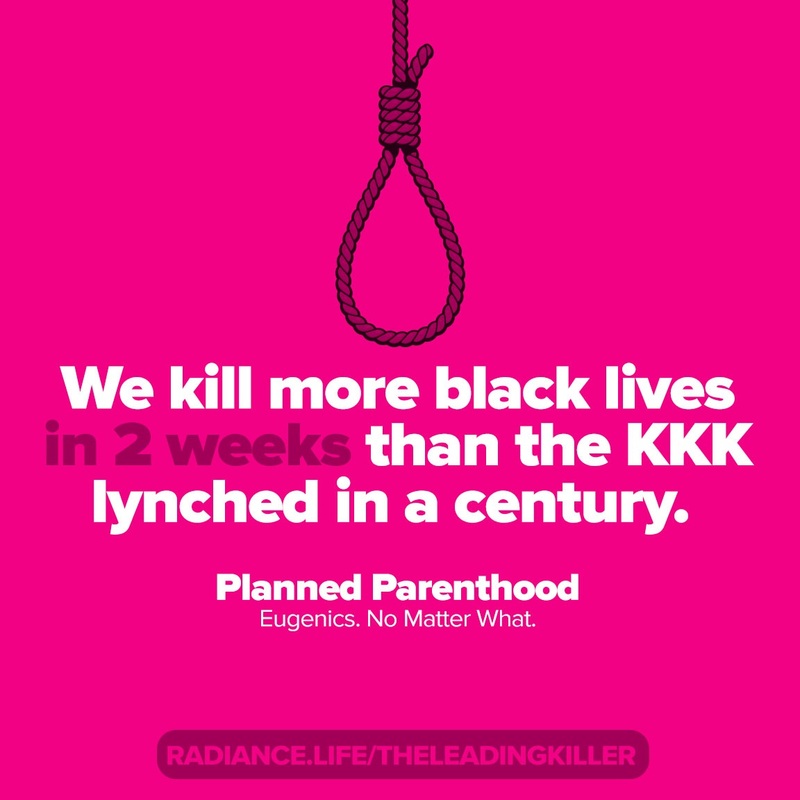 The online graphic reads: "We kill more black lives in 2 weeks than the KKK lynched in a century...Planned Parenthood: Eugenics. No Matter What." The URL in the meme provides the context of how abortion has become the leading killer in the black community. And finally, an image of a noose appears above those words as an instrument of racial violence (which killed an estimated 3,446 African-Americans). Today, an estimated 247 black lives are killed every day by Planned Parenthood with forceps, chemicals and other devices. Thousands liked and loved the meme on social media. It was even posted on Instagram by Bill Johnson – pastor of California megachurch, Bethel Church. I wish more pastors would stand firm in truth and love like he does. If churches actually talked openly about crucial social issues, we'd could better address the brokenness (that only God can heal) in our present. Soooo the meme is the problem, not the genocide. And yes, I used the word genocide. Fannie Lou Hamer did, too. Oh, and so did pre-pro-abortion Rev. Jesse Jackson. Supposedly, because I'm black, I'm allowed to say things people with lighter pigmentation can't. For the love, we're all just one human race (Acts 17:26). Since when is speaking truth relegated to one's pigmentation? There's no justice without truth. Period. Planned Parenthood's founder, Margaret Sanger, boasted about keynoting a Ku Klux Klan meeting on in her autobiography (pp. 366-367). And no, not everyone was a racist in 1938, nor was every political figure open to speaking to a terrorist organization like the KKK. But Sanger found it amusing to address a secret meeting with KKK members and bragged about getting a dozen offers to speak to similar groups. Madison Grant was the co-founder of the deeply racist American Eugenics Society (AES), and his book Passing of the Great Race was considered by Hitler to be his most valuable book. Sanger was a member of the AES and was its most public figure. She led the crusade to, in her own words, "prevent the birth of defectives". Eugen Fischer, the NAZI scientist who conducted heinous experiments in 1906-1908 in Germany's Shark Island holocaust to try to prove that blacks were inferior to whites, was an esteemed colleague of Sanger's. 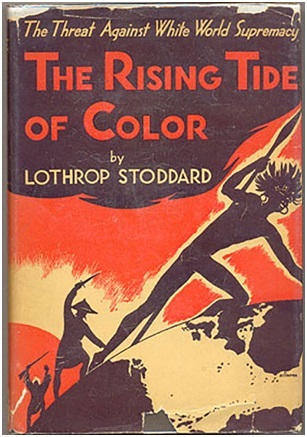 She included him on her advisory council in her 1927 World Population Conference. Fischer's work, Principles of Human Heredity and Race Hygiene, heavily influenced Hitler's vile manifesto, Mein Kampf (My Struggle). If people want to be offended by anything, be offended by a worldview that denies that we're all created equal and justifies the slaughter of the weakest among us. Be offended that women are told by a billion-dollar abortion industry that they're not stronger than their circumstances (Phil 4:13). Be offended that religious leaders (here, here and here) are blessing abortion mills as "holy ground" and "sacred work". Be offended that half a billion of our tax-dollars annually support Planned Parenthood and its promotion of reckless sexual behavior (e.g., their vile new "Freedom to F‑‑‑" campaign). Be offended that pregnancy help centers (which care for mother, father and child – born and unborn) are maligned by pro-abortion activists and MSM instead of being fully and financially supported by churches across the country. But don't be offended because you simply don't know what you don't know.